Standing on a rocky hill and overlooking the river, Bratislava Castle dominates the city and offers panoramic views of the surrounding landscapes, including the neighboring countries of Austria and Hungary. The massive, fully restored building is topped with four corner towers. Look for the well-conserved original part of the structure, the 15th-century Sigismund Gate. The castle houses the national museum and four halls exhibiting archaeological findings, such as the prehistoric statue of the Venus of Moravany. Catch a concert at the Baroque chapel, now converted into a music hall. If you get hungry, dine at the restaurant housed an erstwhile Baroque stable facing an English park. 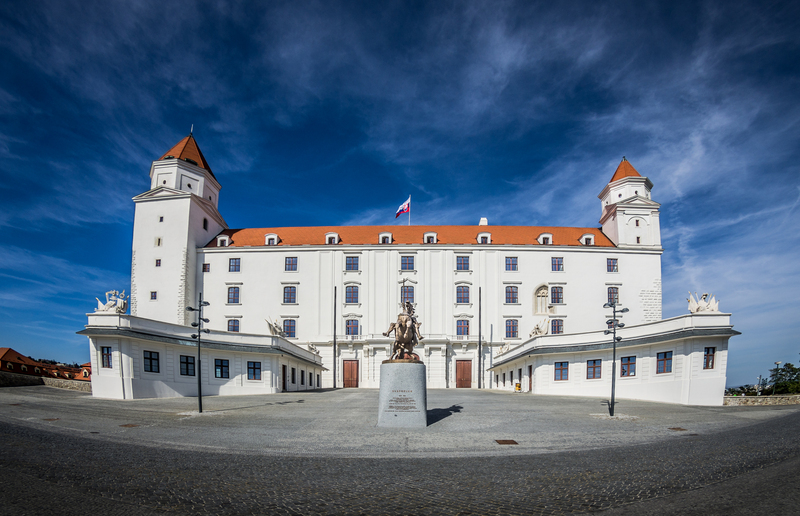 Plan to visit Bratislava Castle during your Bratislava vacation using our convenient Bratislava sightseeing planner . I went not to the Castle but on the outside, it's very nice and the view also. You can see the entire city. It is worth to one another photo. Beautiful views of Bratislava. Easy access to the castle and multiple points that lead to the surrounding old town. There is a lot to see, so would recommend a tour for an overview of the grounds. As of this post some construction on the switchbacks that exit the castle, went early to avoid large groups. Between the castle itself, gardens, ruins, and surrounding walls, take plenty of time to enjoy before heading to the square for coffee or wine. After a short walk up a hill, you are in for a treat. A beautiful view to enjoy, the castle building and gardens, a lot of beautiful lawns to relax in. The restaurant is really good as well, their steak tartar is to die for! Wonderful place. Decent looking castle and museum on top of the hill. The most visited place in Bratislava. It needs some amout of climbing to do and might not be comfortable for wheelchair accessibility. The castle is baroque in style and the exterior is subtle and simple compared to it's history and the interiors. There are very well maintained gardens on the top. The aerial balcony gardens offer a great of the other parts of the city though there isn't too much to see from up here other than the UFO observation desk and the river Danube. The garden was very picturesque and very well maintained. Spotless surrounding grounds. With a very intelligent car parking. Energy saving lighting everywhere. Did not go inside the building as people mentioned not that interesting. One of the best places to take photos of the city. Every day, we help thousands of travelers plan great vacations. Here are some tips on how to use your Listing Page to attract more travelers to your business - Bratislava Castle. Promote your permanent link - https://www.inspirock.com/slovakia/bratislava/bratislava-castle-a910500009 - on your website, your blog, and social media. When a traveler builds a plan from this page, the itinerary automatically includes Bratislava Castle. This is a great way for travelers looking for a great vacation in your city or country to also experience Bratislava Castle. Promoting your link also lets your audience know that you are featured on a rapidly growing travel site. In addition, the more this page is used, the more we will promote Bratislava Castle to other Inspirock users. For best results, use the customized Trip Planning Widget for Bratislava Castle on your website. It has all the advantages mentioned above, plus users to your site can conveniently access it directly on your site. Visitors to your site will appreciate you offering them help with planning their vacation. Setting this up takes just a few minutes - Click here for instructions.